(((Luke Ford))) - I Pledge to Jewry, Goyim Have Made the Alt-Right fail- the (((Dual Loyalty))) Problem! An intrinsic part of the JQ or Jewish Problem is the huge loyalty almost all Jews have for Israel (or Jews in general). Last week, Blindlight noted a wonderful illustration taking place in the chat stream of one Luke Ford, an alt-right proponent and also a converted Jew. One thing about those converted Jews with goy blood, they often put their foot in their mouth and tell the goyim what they really think. I have been pondering if Luke's big mouth will keep him out of Jew heaven when he dies. Perhaps, next time a Jew asks him to swear loyalty to Jewry, Luke could likewise ask the Jew to swear loyalty to him? Sadly, Blindlight believes Luke doesn't weigh all the problems that contributed to this disaster because Luke is likely a "useful idiot" being used as some sort of fake arbitrator between Jews and Gentiles in the reformulation of an alt-right movement that is much more Jew friendly. Luke has not thought about the likely controlled nature of the movement under the leadership of Spencer who has allowed seemingly hidden Jews like Mosley, Enoch and possibly Matt Heimbach, and probably many more, huge roles. Ford hasn't even thought about Charlottesville being staged as a propaganda ploy to brand the alt-right akin to terrorists or the car attack being the icing on the cake of that fake event. Here is my reaction to these occurrences within that chat that show Jewish obsession with themselves, when the reason for it's existence, the Alt-Right, is the White obsession with its self. Here's another example of the problem and it again speaks to the Jewish privilege issue. Israel, a few months ago, bragged about its Olympic team but the problem was half the team was from Britain, the Ukraine and elsewhere, not Israel. This reminds us of WW I when Jews in America rooted for Germany until the Balfour Declaration was signed and then rooted for England. They had done so because they were transplanted Germans. It took just one statement of support for a hypothetical land of Israel to get them all to switch sides including those Jews in Germany that helped start strikes during the final phase of the war. It speaks to the heart of the dual citizen issue when dual means almost always means loyal Jew patriot when push comes to shove. 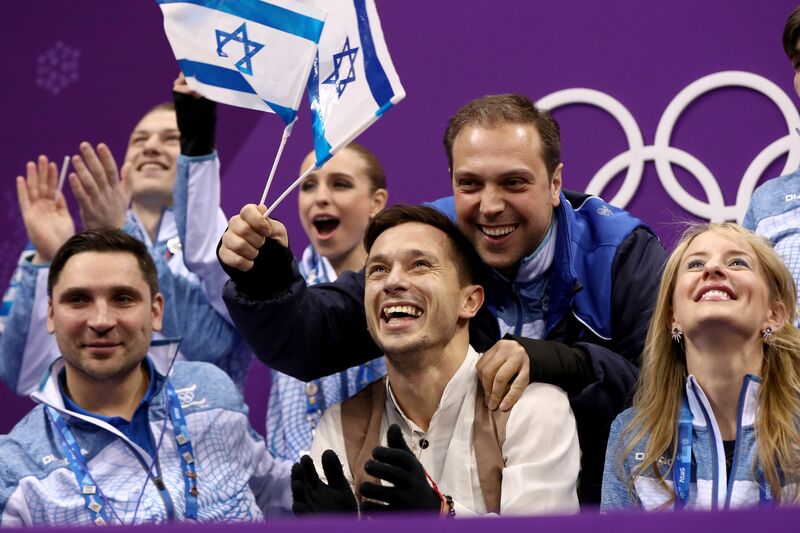 The Israeli figure skating team cheering on champion Alexei Bychenko on Thursday night. It’s an incredible time to be a Zionist. No, hear me out: Gal Gadot has been unofficially elected High Emperess of the Universe, the Netanyahu family keeps entertaining us with darkly amusing leaked recordings of their private conversations leaked to the world, and Israel has sent their largest Winter team to the Olympics in the history of the country. The ten athletes representing Israel at the 2018 Olympics in Pyeongchang hail from Ukraine, America, the UK, and of course, Israel. Much like the story of the birth of Israel, the Olympics are about risking everything in a courageous fight to make your soul’s dearest wish a lived reality while lighting a flame that illuminates the power of shared identity, not to be too dramatic. And this year Israel is massively represented by a crack team of athletes who’ve triumphed over a desert climate to become ice masters. So I’m not saying that if you don’t watch the Winter Olympics you’re supporting BDS, but I’m just saying … you should probably watch the winter Olympics. Let’s get to know these Lions of Zion! Spoiler alert: they’re determined ice-beasts with charisma and beauty to spare, and the training to back it up. And many, many of them make a strong argument for embracing Soviet immigrants to Israel. Israel is strengthened, the athletes can attest, by its diversity.